The income level necessary for families to secure an adequate but modest living standard is an important economic yardstick. While poverty thresholds, generally set at the national level, help to evaluate what it takes for families to live free of serious economic deprivation, the Economic Policy Institute’s Family Budget Calculator (Gould et al. 2015a)—updated in August 2015 with data for 2014—offers a broader measure of economic welfare and provides an additional metric for academics and policy experts looking for comprehensive measures of economic security. The basic family budgets presented in this report, as well as those presented via the Family Budget Calculator itself, measure the income families need in order to attain a secure yet modest living standard where they live by estimating community-specific costs of housing, food, child care, transportation, health care, other necessities, and taxes. The budgets estimate community-specific costs for 10 family types in 618 locations across the U.S.
EPI’s Family Budget Calculator is particularly useful given the inadequacies of both the federal poverty line and the Supplemental Poverty Measure (SPM) when it comes to measuring families’ fundamental needs (CCED 2013). EPI’s basic family budgets overcome many of these shortcomings by providing a wealth of geographic and family-type detail; they are calculated for 618 U.S. communities and 10 family types (either one or two adults with up to four children, including, for the first time, adults without children). The rich detail afforded by these geographic and family-type customizations, the relative accessibility of these numbers, and the rigor and transparency with which they are developed make the family budgets presented in this report and via the Family Budget Calculator uniquely valuable to non-experts and academics alike. This issue brief begins by explaining in greater detail the advantages of EPI’s basic family budgets as compared with the federal poverty line and the Supplemental Poverty Measure. 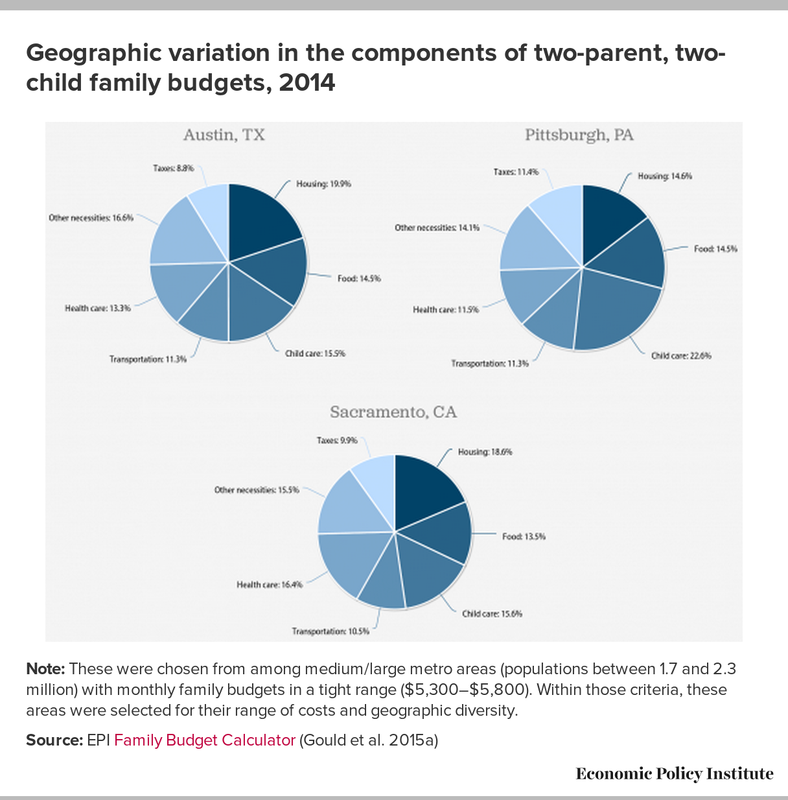 It then illustrates the budgets’ most important feature—their high degree of customizability by family type and community—by demonstrating how family budgets vary significantly depending on family composition and geographical area. The basic family budget for a two-parent, two-child family ranges from $49,114 (Morristown, Tenn.) to $106,493 (Washington, D.C.). In the median family budget area for this family type, Des Moines, Iowa, a two-parent, two-child family needs $63,741 to secure an adequate but modest living standard. This is well above the 2014 poverty threshold of $24,008 for this family type. For a two-parent, two-child household, housing ranges from 10.2 percent of a family’s budget in Binghamton, N.Y., to 25.6 percent in San Francisco. Housing for this family type is most expensive in San Francisco ($1,956 per month), and is least expensive in Franklin, Poinsett, and Grant counties in Arkansas ($561 per month). Across regions and family types, child care costs account for the greatest variability in family budgets. Monthly child care costs for a two-parent, one-child household range from $344 in rural South Carolina to $1,472 in Washington, D.C. In the latter, monthly child care costs for a two-parent, three-child household are $2,784—nearly 90 percent higher than for a two-parent, one-child household. Among two-parent, two-child families, child care costs exceed rent in 500 out of 618 family budget areas. Even in the best of economic times, many parents in low-wage jobs will not earn enough through work to meet basic family needs. Annual wages for one full-time, full-year worker earning the federal minimum wage total $15,080. Even when accounting for higher minimum wages in states and localities, this full-time, full-year minimum-wage worker is paid below what is necessary for one adult to meet her local family budget—and far below what it takes for an adult with even just one child to make ends meet anywhere. Official poverty thresholds such as the federal poverty line and Supplemental Poverty Measure are incomplete indicators of what it takes for families to live free of economic hardship. EPI’s family budgets overcome the most substantial limitations of these measures and paint a portrait of what families need in order to live securely yet modestly. Poverty thresholds are generally national income levels used to measure the number and share of Americans who are economically deprived. Conceptually, these measures are important metrics, but are fundamentally different from EPI’s basic family budgets. Families above poverty thresholds are just thought to be free of outright material deprivation. In contrast, family budgets offer a broader measure of economic adequacy by measuring the dollar amount necessary for families to live securely but modestly in various communities across the nation. The federal poverty line is also woefully outdated, and little has been done officially to remedy the situation. For instance, the current methodology for determining the federal poverty line was designed four decades ago in 1963 and has only been updated since for overall inflation. Thus, for example, the decline in prices of high-end electronics over the past generation has put downward pressure on the poverty threshold and measured poverty rates, even though the price of smartphones has very little to do with whether families experience outright material deprivation. Academics, policy analysts, and social scientists—most of whom agree that the federal poverty line is seriously outdated—have been engaged in dialogue and debate about alternative measures for some time. In response, the first Supplemental Poverty Measure was published in 2011 to better reflect both the resources available to families and to provide a more accurate threshold of economic adequacy (Short 2011). This new measure calculates the financial resources it takes to live free of material deprivation—i.e., the cost of food, clothing, shelter, and utilities—by adjusting for average expenditures on these items (and accounting for geographic differences in housing costs) as opposed to simply adjusting for overall inflation. In addition, to calculate a poverty rate, the SPM reflects the resources available to households through government policies such as tax credits and in-kind public benefit programs that affect a family’s income and hence, their poverty status. While the Supplemental Poverty Measure does provide a more comprehensive metric than the federal poverty line, it does not measure child care costs appropriately and uses geographic variability only for its housing calculation (CCED 2013). SPM data are also limited to relatively large geographic areas. The EPI Family Budget Calculator overcomes many of the shortcomings of the federal poverty line and the Supplemental Poverty Measure by illustrating the income required to afford an adequate standard of living for 10 family types living in 618 specific U.S. communities. As will be explained in greater detail shortly, that the budgets differ by location is important, since certain costs, such as housing, vary significantly depending on where one resides. Geographical cost-of-living differences are built into the budget calculations by incorporating regional, state, or local variations in prices (depending on item). This geographic dimension of EPI’s family budget measurements offers a comparative advantage over using poverty thresholds, which only use a national baseline in their measurements (e.g., the federal poverty line), or which use a geographic component only for measuring home prices (e.g., the SPM). Basic family budget measurements are also adjustable by family type because, as illustrated in the following section, expenses vary considerably depending on the number of children in a family, if any, and whether a family is headed by a single parent or two parents. The 10 family types include one or two adults with zero to four children. To estimate family costs, we assume one-child families have a 4-year-old, and that a second child is 8 years old, a third 12 years old, and a fourth 16 years old. The following is a brief description of each component of EPI’s basic family budgets and the restrictions and/or working assumptions employed. For a comprehensive discussion of our methods and data sources, see Gould et al. (2015b). Housing costs are based on the Department of Housing and Urban Development’s (HUD) fair market rents, or FMRs (HUD 2014). FMRs represent rents (shelter rent plus utilities) at the 40th percentile (i.e., the dollar amount below which 40 percent of standard quality rental units are rented) for privately owned, structurally safe, and sanitary rental housing of a modest nature with suitable amenities. Rents for studio apartments were used for one-person families, one-bedroom apartments were used for two-adult families, two-bedroom apartments were used for families with one or two children, and three-bedroom apartments were used for families with three or four children (based on HUD guidelines). Food costs are based on the “low-cost plan” taken from the Department of Agriculture report Official USDA Food Plans: Cost of Food at Home at Four Levels (USDA 2014). This plan is the second-least-expensive of four types of food plans and assumes almost all food is bought at the grocery store and then prepared at home. The USDA food plans represent the amount families need to spend to achieve nutritionally adequate diets. Transportation expenses are based on the costs of owning and operating a car for work and other necessary trips. The National Household Travel Survey (FHA 2009) is used to derive costs based on average miles driven per month by size of the metropolitan statistical area or rural area and multiplied by the cost per mile, as provided by the Internal Revenue Service (IRS 2013). Child care expenses are based on costs of center-based child care and family-based care for 4-year-olds and school-age children, as reported by the Child Care Aware of America annual report on the cost of child care by state (CCAA 2014). We assume all families in urban areas utilize center-based care and all families in rural areas utilize family-based care. Health care expenses have two components: Affordable Care Act insurance premiums and out-of-pocket expenditures. Premiums are based on the lowest-cost bronze plan in the rating area, adjusted for family size, age of user, and tobacco surcharge (Kaiser 2014). For the purpose of the family budgets, all members of the family are assumed to be non-smokers, and all adults are assumed to be 40 years old. Out-of-pocket medical expenditures are calculated for adults and children separately by region and are differentiated between metropolitan statistical areas and non–metropolitan statistical areas for those covered by private insurance (HHS 2014). EPI’s basic family budgets include the costs of other necessities such as apparel, entertainment, personal care expenses, household supplies (including furnishings and equipment, household operations, housekeeping supplies, and telephone services), reading materials, school supplies, and other miscellaneous items of necessity as reported for the second quintile from the Bureau of Labor Statistics Consumer Expenditure Survey (BLS 2014). The family budget components enumerated thus far sum to the family’s post-tax income. To calculate the tax component of family budgets, we utilize the National Bureau of Economic Research’s Internet TAXSIM (NBER 2013) to gather information on federal personal income taxes, state income taxes, and federal Social Security and Medicare payroll taxes. 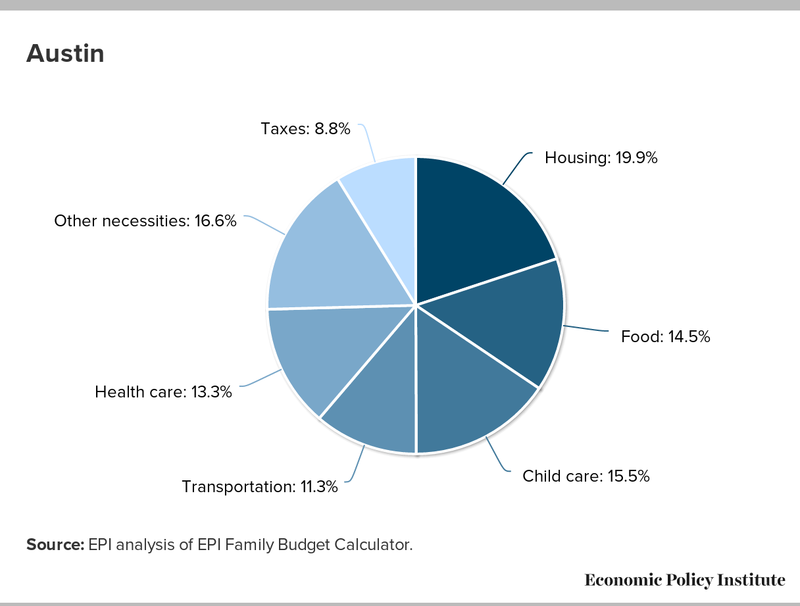 EPI’s basic family budgets sum each of these components to get the total cost of living in each area across the United States. Notably, these budgets do not include several components of what might be considered a middle-class lifestyle. In particular, they do not include any savings: There are no savings for a rainy day (e.g., job loss or unexpected medical bills), savings for retirement (except through Social Security payments), or further investments in their children (e.g., enrichment activities or college savings). Thus, these are adequate but decidedly modest family budgets. As compared with previous iterations of the Family Budget Calculator, three major changes were included in this update. First, we have added four additional family types: single persons without children, married couples without children, single parents with four children, and married couples with four children. Second, our new health cost calculation reflects premiums available in the health insurance exchanges established by the Affordable Care Act. Third, the “other necessities” category now includes additional items previously excluded, such as housekeeping supplies and telephone services. Because of these enhancements, the 2015 family budgets are not comparable to previous versions. What we sacrifice in cross-time comparisons, we compensate for with the most up-to-date and relevant methodology. Budgets rise significantly with family size, since more children require more housing, health care, and child care. Monthly child care costs for a two-parent, one-child household can be as low as $344 in rural South Carolina and as high as $1,472 in Washington, D.C. In the latter, monthly child care costs for a two-parent, three-child household are $2,784—nearly 90 percent higher than for a two-parent, one-child household. For illustrative purposes, the monthly family budgets for eight different family types in Des Moines, Iowa, the middle-priced family budget area,1 are depicted in Figure A. They range from $2,236 for a one-adult family to $6,358 for a two-parent, three-child family (though not shown here, data for four-children families can be found in the Family Budget Calculator). Some items, such as transportation, do not change substantially with the number of children in a family, but an expense such as child care does. This becomes apparent when comparing the two family types that contain two people. A one-adult, one-child household monthly budget ($3,854) exceeds a two-adult household budget ($3,132) by $722, with childcare ($673) accounting for over 90 percent of the difference. 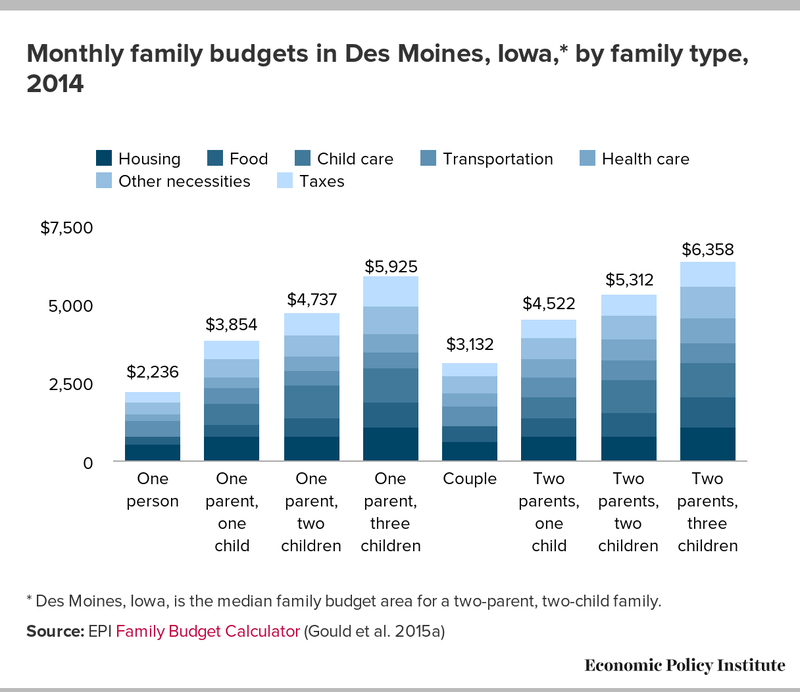 * Des Moines, Iowa, is the median family budget area for a two-parent, two-child family. In Des Moines, child care consumes 14.9 percent of the budget for a two-parent, one-child family—but for a two-parent, three-child family, it accounts for 17.4 percent, an increase in dollar value of nearly 65 percent. In addition to varying by family type, many costs vary widely by geographic area. However, as mentioned previously, neither the federal poverty line nor the Supplemental Poverty Measure accounts for these geographic differences to the extent that EPI’s Family Budget Calculator does. 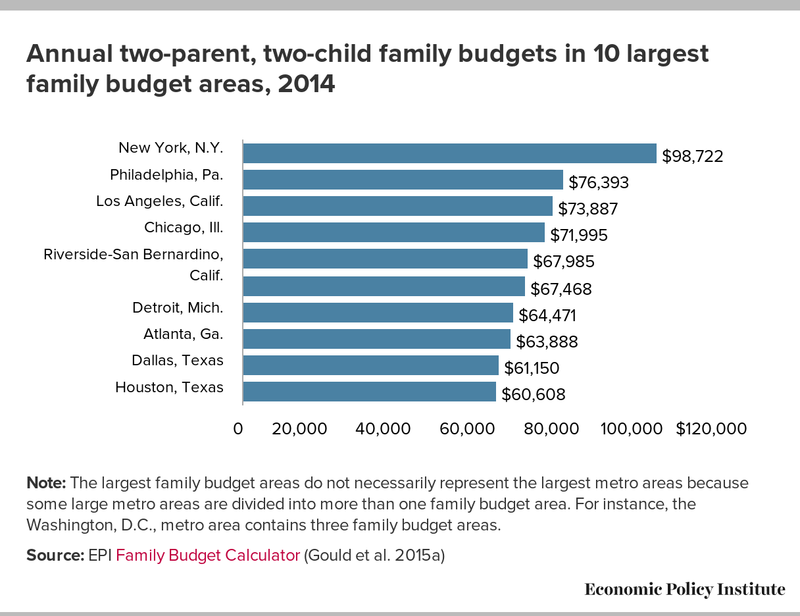 The most expensive two-parent, two-child family budget area is Washington, D.C., at $106,493, while the least expensive is Morristown, Tenn., at $49,114. All two-parent, two-child family budgets across the country significantly exceed the federal poverty line for that family type, which stood at $24,008 in 2014 (U.S. Census Bureau 2014). Figure B, which compares the annual budget for a family of four (composed of two parents and two children) in the 10 largest family budget areas, depicts the importance of accounting for geographic differences in the cost of living.2 The annual budget for a two-parent, two-child family in New York City is $98,722—over 60 percent higher than that of a similar Houston family ($60,608). This overall geographic variation is driven largely by variability among the housing and child care components. For example, for a two-parent, two-child household, housing ranges from 10.2 percent of a family’s budget in Binghamton, N.Y., to 25.6 percent of a family’s budget in San Francisco. Housing for this family type is most expensive in San Francisco ($1,956 per month), and is least expensive in Franklin, Poinsett, and Grant counties in Arkansas ($561 per month). Note: The largest family budget areas do not necessarily represent the largest metro areas because some large metro areas are divided into more than one family budget area. For instance, the Washington, D.C., metro area contains three family budget areas. Among two-parent, two-child families, child care costs exceed rent in 500 out of 618 family budget areas. The largest disparity occurs in Binghamton, N.Y., were monthly child care expenses exceed rent by just over $1,300. On the other end of the spectrum, rent for two-parent, two-child families in San Francisco far outweighs child care costs by over $1,000 a month. Source: EPI analysis of EPI Family Budget Calculator. Note: These were chosen from among medium/large metro areas (populations between 1.7 and 2.3 million) with monthly family budgets in a tight range ($5,300–$5,800). Within those criteria, these areas were selected for their range of costs and geographic diversity. In Austin, where monthly rent for a two-bedroom apartment is $1,074, families can expect a fifth (19.9 percent) of their budgets will be spent on housing. 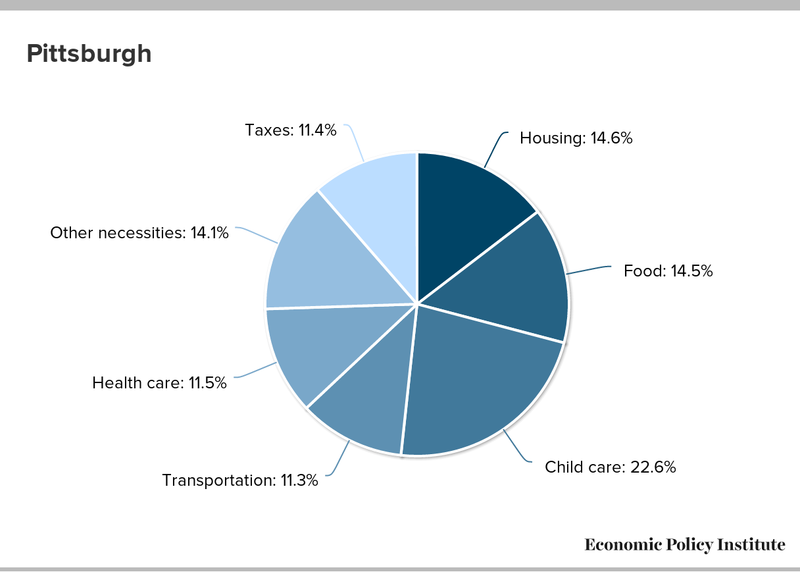 This contrasts with only 14.6 percent for Pittsburgh residents. While families in Pittsburgh devote 22.6 percent of their monthly budgets to child care, the share stands at less than a sixth in both Austin and Sacramento. Health care costs also vary considerably across geographic areas. 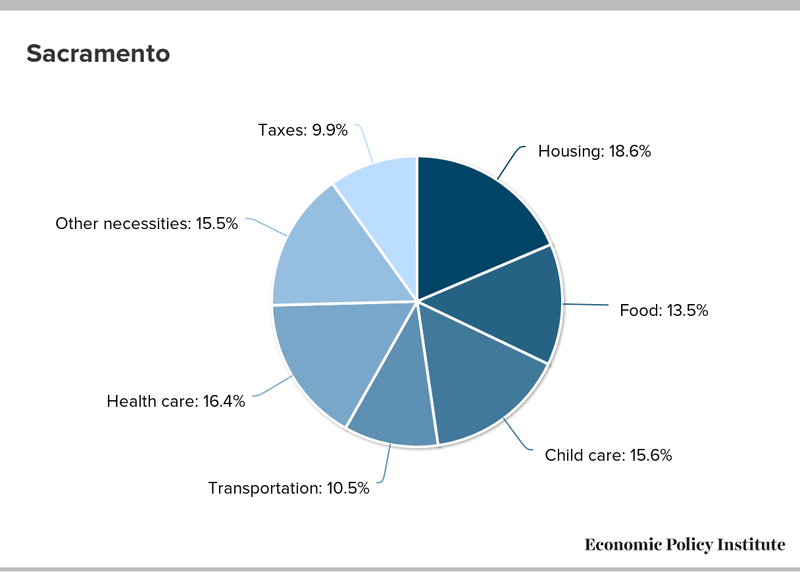 Families in Sacramento spend 16.4 percent of their budgets on health care, while those in Pittsburgh allocate only 11.5 percent. 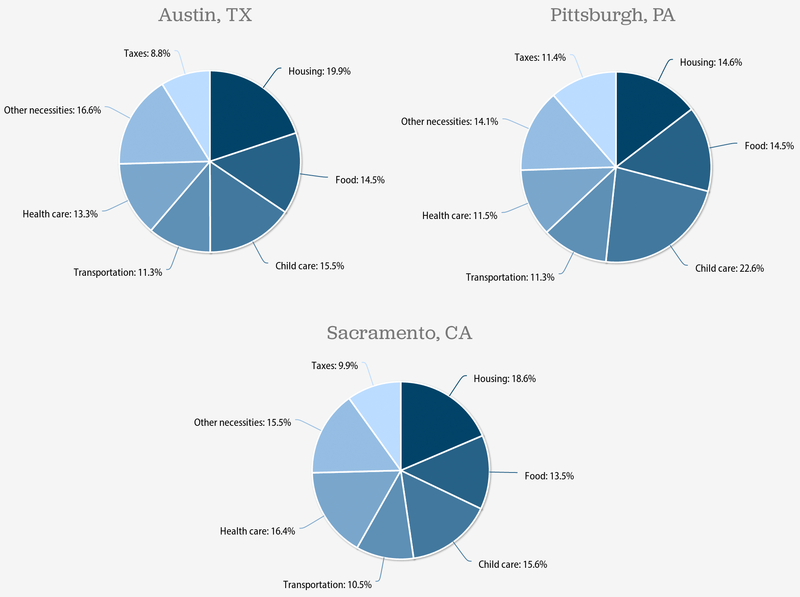 Those living in Pittsburgh also spend a larger share of their budgets on taxes (11.4 percent) than do residents of Austin (8.8 percent). The EPI family budgets serve as a foundation for future research assessing how many Americans are able to obtain an adequate living standard. The budgets can also be paired with future research to document what income sources are providing (or failing to provide) the resources necessary to meet these budgets. It is clear that even in the best of economic times, many parents in low-wage jobs will not earn enough through work to meet basic family needs. A full-time, full-year worker paid $7.25 per hour (the federal minimum wage) will earn about $15,080 a year before taxes (DOL 2009). This is below the federal poverty line of $16,317 for a single parent with one child—and far below the income necessary for such a family to attain a secure living standard even in the least expensive family budget area (which stands at $34,881 for that family type in Morristown, Tenn.). Even when accounting for higher minimum wages in states and localities, a full-time, full-year minimum-wage worker is paid below what is necessary for one adult to meet her local family budget—and far below what it takes for an adult with even just one child to make ends meet anywhere. When earnings from work do not push families over the family budget thresholds, publicly provided work supports can assist workers. The Earned Income Tax Credit (EITC); child care subsidies and tax credits; food stamps (i.e., the Supplemental Nutrition Assistance Program); and subsidies for housing, transportation, and health care have increased post-tax incomes and consumption for working families. Being a working member of our economy has associated costs, such as transportation to and from work and the expense of child care. As shown in EPI’s family budgets, child care costs, on average, account for around 20 percent of family budgets in the typical budget area for a two-parent, two-child family. This particular expenditure is thus clearly an important leverage point for using work supports to narrow the gap between earnings and needs. Through such work supports, we can help ensure the economy works to the benefit of all Americans. The authors acknowledge the Ford Foundation and the Public Welfare Foundation for their generous support. Additionally, the authors thank David Cooper, EPI economic policy analyst, for his technical assistance and local economy expertise, and Cynthia Cox at the Kaiser Family Foundation for assistance with the bronze plan premium data files. Elise Gould, senior economist, joined EPI in 2003 and is the institute’s director of health policy research. Her research areas include wages, poverty, economic mobility, and health care. She is a co-author of The State of Working America, 12th Edition. In the past, she has authored a chapter on health in The State of Working America 2008/09; co-authored a book on health insurance coverage in retirement; published in venues such as The Chronicle of Higher Education, Challenge Magazine, and Tax Notes; and written for academic journals including Health Economics, Health Affairs, Journal of Aging and Social Policy, Risk Management & Insurance Review, Environmental Health Perspectives, and International Journal of Health Services. She holds a master’s in public affairs from the University of Texas at Austin and a Ph.D. in economics from the University of Wisconsin at Madison. Tanyell Cooke joined EPI in 2014. As a research assistant, she supports the research of EPI’s economists on topics such as wages, labor markets, inequality, education, race and ethnicity, and immigration. She holds a B.A. in economics and statistics from The George Washington University. Will Kimball joined EPI in 2013. As a research assistant, he supports the research of EPI’s economists on topics such as wages, labor markets, macroeconomics, international trade, and health insurance. Prior to joining EPI, Will worked at the Center on Budget and Policy Priorities and the Center for Economic and Policy Research. He holds a B.A. in economics and political science from the University of Connecticut. 1. Des Moines ranks in the middle among all the MSAs and rural areas for two-parent, two-child families. This ranking averages costs for MSAs that cross state lines. 2. The largest family budget areas do not necessarily represent the largest metro areas because some large metro areas are divided into more than one family budget area. For instance, the Washington, D.C., metro area contains three family budget areas. 3. All three metro areas have populations between 1.7 and 2.3 million and monthly family budgets between $5,300 and $5,800. Within those criteria, they were selected for their range of costs and geographic diversity. Bureau of Labor Statistics (BLS). 2014. Consumer Expenditure Survey. Current Expenditure Tables. Child Care Aware of America (CCAA). 2014. Parents and the High Cost of Child Care: 2014 Report. Federal Highway Administration (FHA). 2009. National Household Travel Survey (NHTS). Tabulation created on the NHTS website. Gould, Elise, Tanyell Cooke, Alyssa Davis, and Will Kimball. 2015a. 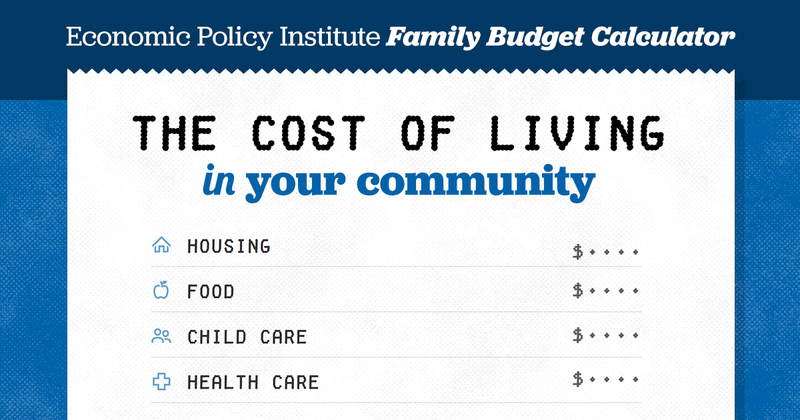 “Family Budget Calculator.” Economic Policy Institute. Gould, Elise, Tanyell Cooke, Alyssa Davis, and Will Kimball. 2015b. Economic Policy Institute 2015 Family Budget Calculator: Technical Documentation. Economic Policy Institute, Working Paper No. 299. Insight Center for Community Economic Development (CCED). 2013. Measuring Up: Aspirations for Economic Security in the 21st Century. Internal Revenue Service (IRS). 2013. “2014 Standard Mileage Rates.” IRS Announcement 2013-95. Short, Kathleen. 2011. “The Research Supplemental Poverty Measure: 2010.” Current Population Reports, U.S. Census Bureau, November. U.S. Census Bureau. 2014. “Poverty Thresholds for 2014 by Size of Family and Number of Related Children Under 18 Years” [data tables]. U.S. Department of Agriculture Center for Nutrition Policy and Promotion (USDA). 2014. “Cost of Food at Home: U.S. Average at Four Cost Levels” (June 2014 annual average). U.S. Department of Health and Human Services (HHS). 2014. “Medical Expenditure Panel Survey HC-155 2012 Full Year Consolidated Data File” [microdata]. U.S. Department of Housing and Urban Development (HUD). 2014. “Fair Market Rents dataset” [county- level data file]. U.S. Department of Labor, Wage and Hour Division (DOL). 2009. “Federal Minimum Wage Rates Under the Fair Labor Standards Act” [table].